The Januariuskapelle is a high-Baroque chapel in the third district of Vienna (Landstraße) designed by the famous architect Lukas von Hildebrandt. It was built in 1735 and was the main chapel of the garden palais of the Harrach family, one of the most distinguished noble families in the Habsburg Empire. 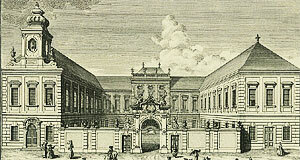 For further information on what a garden palais is, please read my general introduction to the "Palais of Vienna". The Januariuskapelle was built for Count Aloys of Harrach, governor and viceroy of Naples. The patron saint of Naples is San Gennaro and the "Januarius" is the Latinised version of his name. Aloys of Harrach chose this name to commemorate the survival of his family during an epidemic of the Bubonic plague in and around Naples in 1732 and 1733. The garden palais was one of the bigger palaces in Vienna. Under the rule of Emperor Ferdinand I, the hospital Rudolfstiftung was established in the Palais Harrach. Between 1850 and 1918, it served as a training facility and academy for the Royal and Imperial Cavalry ("k. & k. Militär-Reitlehrinstitut"). With WWI, the era of cavalry units ended and the facilities were used for administrative purposes; however, they generally fell under disrepair. Towards the end of WWII, the enormous palais got a few hits by bombs and was completely destroyed. The remaining ruins were demolished until the 1960ies. The Januariuskapelle was also damaged by the bombs; nevertheless, it was fixed instead getting demolished. However, the state of the chapel was a bad one. The outside was refurbished by 1960, but it took until the mid-1980ies until the entire chapel was thoroughly refurbished. This was done when the area around it was used for the construction of a HTL school. In 1987, the Januariuskapelle was re-opened with a ceremonial service. Noteworthy in the interiors is the main altar painting by Martino Altomonte; it depicts the decapitation of San Gennaro / St. Januarius. The surroundings of the former Palais Harrach / Januariuskapelle were also hit hard by WWII and developed in the decades after the war. As a neighbourhood, it is not terribly attractive. Attractions nearby include the Flak Tower in the Arenbergpark; the Kirche Maria Geburt; the Rochusmarkt and church; the Palais Rasumofsky; and Palais Wittgenstein. The Russenkirche St. Nikolaus is nearby, and the Rabenhof is in walking distance; northwards, you get to the Belvedere Palace, the Gardekirche and the other attractions of the Schwarzenbergplatz as well as the Stadtpark.